Whilst I have limited time, I am working on a rather large open source project where I kind of do a lot of this already, and I wanted to write some of that up, so I thought I could take some time out to create a rather dumbed down article which shows some of the stuff I do in my larger OSS project. I have provided a simple console app demo client, for the moment. I plan on coming back and making a better front end when I have more time. Where I work we have a number of disparate systems, which were all written at different times by different people, luckily all use the same technologies, that being .NET. Though they are all written in differing versions of .NET, for example my team is lucky enough to be able to work in .NET3.5 SP1 / .NET 4.0, but we must also interface to older systems, and some other newâ€™ish systems. For the newish systems itâ€™s a no brainer we use WCF, and as we want all messages to be reliable we use MSMQ binding for that. But for the older systems it is a problem, do you write some custom MSMQ code, or do you look around for some sort of generic messaging solution. I decided that I would look around and see what was freely available generic messaging solutions are out there, and I decided to write up my findings in a new article which goes into my findings in quite a lot of detail. It also offers Pub/Sub, FullDuplex Client Server types of topology, and inbuilt message persistence using NHibernate, and allows the users to pick their own IOC container of choice. It seemed to more than fill our requirements. I should mention that it did take me a while to get my head around how NServiceBus does things, all of which I present in the article. I am really pleased with how the article turned out, and would urge you all to have a read, and if you like what you see please leave me a vote/comment I would appreciate that. These articles do take a while to write/investigate, and it is always nice to know ones hard work is appreciated, so as I say if you like the article please DO leave a vote/comment on the articles forum. I’m sure this has been said before but you really should write a book imho. I’m not going to vote a 5 because I’d rather vote with my cash frankly!! Now this is not the 1st time someone has suggested that I write a book, I was just wondering how many people would actually like me to write a book. If you would could you leave a comment here, so that I can tell who would buy the book, and how many folk think it would be a good idea. The sort of thing that I would try and cover is what I normally cover, which would be how to work with a mixture of technologies all used together, So this may include WCF/WPF/WF/LINQ/Custom controls/ASP .NET Silverlight all working together. Typically this would be to solve some problem that I make up, where the problem show cases how to use the technology really. PS : I am running out of time to say thanks to all of you that have encouraged me to do this. I am going to look into it. I just wanted to say a big thanks to you all. Lately I have been neglecting my coding duties a bit in order to go out and get drunk actually. Which I have become a bit tired of now, so I am back onto the code, which is a good place. Now I am in the process of creating another article, and though I can not reveal what I am working on, as there is a competition involved, which I would like to have a pop at, I thought I may share bits of information about parts of it along the way. I can say that I am using some new WCF stuff that came with .NET 3.5, namely the System.ServiceModel.Web namespace which allows us to create RESTful WCF services. For those that do not know what REST is, here is what Wikipedia has to say about it. "Representational state transfer (REST) is a style of software architecture for distributed hypermedia systems such as the World Wide Web. As such, it is not strictly a method for building "web services." The terms "representational state transfer" and "REST" were introduced in 2000 in the doctoral dissertation of Roy Fielding, one of the principal authors of the Hypertext Transfer Protocol (HTTP) specification. REST strictly refers to a collection of network architecture principles which outline how resources are defined and addressed. The term is often used in a looser sense to describe any simple interface which transmits domain-specific data over HTTP without an additional messaging layer such as SOAP or session tracking via HTTP cookies. These two meanings can conflict as well as overlap. It is possible to design a software system in accordance with Fielding’s REST architectural style without using HTTP and without interacting with the World Wide Web. It is also possible to design simple XML+HTTP interfaces which do not conform to REST principles, and instead follow a model of remote procedure call. The difference between the uses of the term "REST" therefore causes some confusion in technical discussions. Systems which follow Fielding’s REST principles are often referred to as "RESTful"." Basically what it means as a WCF developer is that you will expose resources which are accessible via Urls, which means all a client needs to use your service is a browser. Ok so lets get on to some code. This blog post will simply cover the new attributes that enable RESTful WCF. "The WebGetAttribute attribute is applied to a service operation in addition to the OperationContractAttribute and associates the operation with a UriTemplate as well as the HTTP protocol Get verb. The association with HTTP Get verb means that the operation is used to retrieve information from the service. The WebGetAttribute attribute is a passive operation behavior (the IOperationBehavior methods do nothing) that adds metadata to the operation description. Applying the WebGetAttribute attribute to a service operation has no effect unless a behavior that is looking for this metadata in the operation description (such as WebHttpBehavior) is added to the service’s behavior collection." "The WebInvokeAttribute attribute is applied to a service operation in addition to the OperationContractAttribute and associates the operation with a UriTemplate as well as an underlying transport verb that represents an invocation (for example, HTTP POST, PUT, or DELETE). The WebInvokeAttribute attribute is a passive operation behavior (the IOperationBehavior methods do nothing) that adds metadata to the operation description. Applying the WebInvokeAttribute attribute to a service operation has no effect unless a behavior that looks for this metadata in the operation description (such as WebHttpBehavior) is added to the service’s behavior collection. 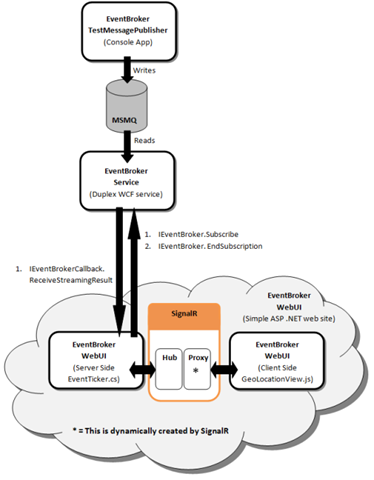 The WebInvokeAttribute determines what HTTP method that a service operation responds to. By default, all methods that have the WebInvokeAttribute applied respond to POST requests. 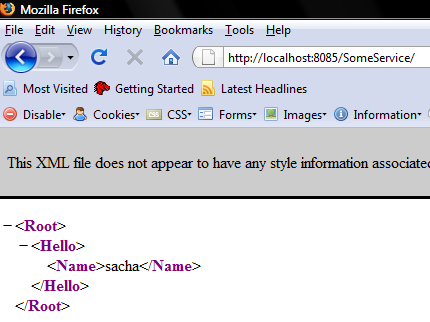 The Method property allows you to specify a different HTTP method. 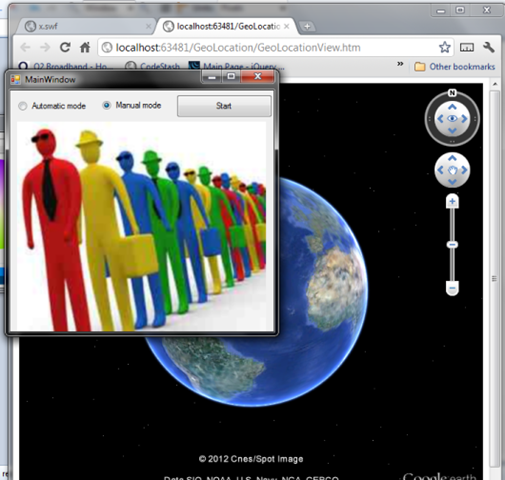 If you want a service operation to respond to GET, use the WebGetAttribute instead." 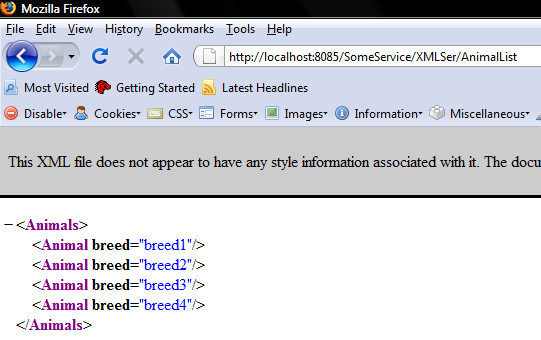 Let us now see some WCF code that uses one of these attributes. I am going to only discuss the usage of the WebGetAttribute in this post as I do not want to talk about all the CRUD operations that can be done with RESTful WCF just yet. 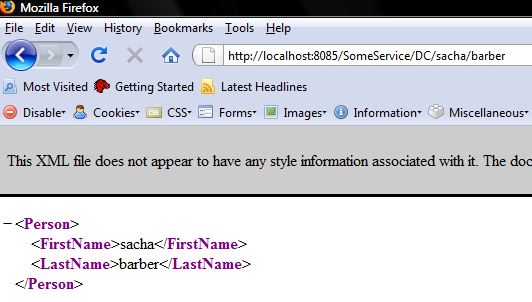 Notice that I have used the WebGetAttribute to adorn the WCF OperationContract methods. Also notice that there is a UriTemplate property which is set to either a root terminator "/" or has some more parts to the Url, where the extra parts of the Url are treated as method parameters, which allow more specific resources to be exposed. In essence that is all there is to allowing a service to expose resources. Now we need to test this. In order to do that we need to implement this example service, so lets have a look at a small demo app I knocked up. So you can see for each of the WebGetAttribute adorned WCF OperationContract methods, we will return a Message, which is really just some XML, which browsers will know how to display. If you don’t know what a Message Type is, do not worry we will be covering that in a subsequent post. 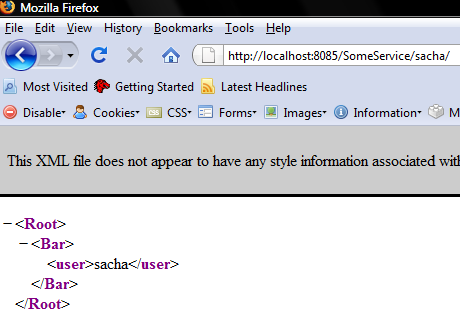 For now the important thing to note is that the service is exposing resources over REST using Urls. The attached demo code includes a simply host, which when run will allow you to test various REST calls. I hope you can see that by using these new RESTful attributes we can expose resources via Urls, which is accessable simply using a Browser. 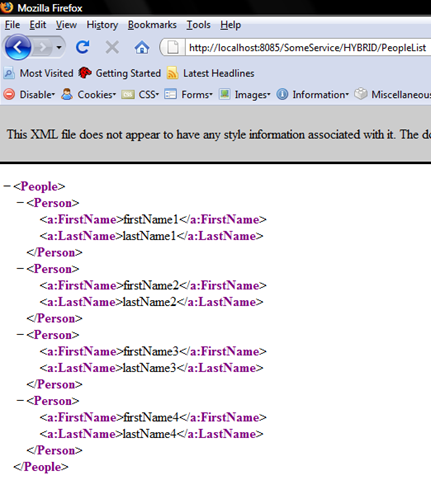 Of course to parse the XML there are many options. Here is a small demo app that has a very simple RESTful service and a very simple Console host.